We live in barrios of mind. All these places …. all those invisibles that seem so far more real than the tangibles we interfere with in our daily lifes. However, there is a strange ambivalence. On the one hand there are invisibles whose intangibility seems to call for an immersion into the world of the tangible stuff. Here the tangibles give them grounding, convey sense, perspective, somehow curtailing the drifting we may experience. On the other hand there are invisibles that are so real, that the tangibles act like distortions, illusions, or worse. The first ones are beings like data, information, functions, goals, ambitions, practical constraints. The second ones are like conscience, compassion, the traits of character, the soul, the soul behind the soul, dreams, love, guilt. In a sense it feels like the difference between both is one of mind and spirit. It thus appears that there are invisibles that need tangibles in order to behold meaning and to reduce harm. And that there are invisibles that need the distance to the tangibles in order not to perish, in order to give us the amiability to act with kindness. Perhaps it comes down to this: There are invisibles that need the immersion with the tangibles to become or to stay gentle, and there are others that have to keep a distance in order to stay that way. At times it seems they are two clearly distinct realms of invisibles; sometimes they seem to mingle. I guess our time is one in which the barrios are distinct, and in which the invisibles that need immersion are the more prominent beings. The other ones, those that need a distance, seem shallow today and became shadows. Today it seems difficult for us to decide which of both are the important, the prominent, the real ones. Former times didn’t have such problems. But not knowing whether data or souls are more important, and our baffling confusion in dealing with both kinds of intangible invisibles, this is rather new, and a characteristic of our time. As we tend to confuse both kinds of invisibles, we tend to confuse where and with which to immerse ourselves. We treat the beings like data and information as existing in a realm of their own, whereas souls, sentiments, conscience, love, dreams seem relegated to the tangible world. As we don’t find them there as stuff or tangibles, we begin to forget them. Strata of information and data become the new world apart from the material one, to be cherished, and to be a devotee of. Of course, both intangibles interact with the world. What would compassion be without being directed to the beings in (or of) the world? And could compassion survive if it would be treated as a being solely apart from the tangibles? Of course not. But it is the way we look onto such things that flipped the other way round. Even as compassion is directed to the world, the understanding and cherishing of it, the awareness of its being a being, comes from the inner realms, not the outer. Likewise, seeing data directed to the world is trivial. But they have to be looked at from the world of the tangibles in order for them to make sense. It is both ways of looking onto invisibles that gets confused. We look onto the spiritual invisibles from the angle of the tangible world, whereas the intellectual invisibles are seen from the world of the intangibles. Data, information, goals, and functions become things in themselves, whereas compassion, conscience, the soul and the soul behind it become functions of a material world in which they get lost. I guess from this comes some kind of misapprehension. We not just cherish, we promote the wrong things. We value data, not intuitions. We mourn the loss of information or knowledge (even in the guise of orally passed-on indigenous one), not that of compassion and conscience. We find data to be real, and the soul to be an invention. We cherish what we make, not what we are and what we do. We need to look more closely to discern those different beings that are invisible and nevertheless form barrios of mind. What are years for? They are here to carry our burdens, take them off our shoulders, to put them onto theirs. To see the years doing this is like first recognizing what good servants they can be. Even when in agony, or in prison, or in the psychiatric ward, they are to our service. They are here to shoulder the load we are are incapable of carrying for ourselves. The years, it seems, are like mules, trotting in circles, although not pumping water or grinding grain, but to carry the stuff we can’t. See them come and pass. Watch them grin, greeting each others, at times casting a stealthy glance upon us, as if to ascertain whether we are still there, still care, still these same fools. The years, it seems, can live without us, but not vice versa. We need them, in fact, not to count down the path already walked or the agony lately spent, we need them to make sure our souls reach wider than the boundaries of our skins. Although in doing so, we mostly forget that in that way the years no longer are just, or: primarily, ours, but those of everybody else. The years blend the burdens of many. The burdens, that is, which we can’t get rid of by ourselves, which, therefore, need to get rid of us by the years, who carry them until they got so light and diaphanous that they seem to have vanished, one day, finally. between your stuff and that of your neighbour. You need to — the years just carry them. When I recently met some of them down in the valley, they kind of got startlet. They had been conversing with each other, the ones from the childhood and those of my times when I had grown into my twenties. A family reunion, it seems, had been the occasion for their coming forth. They had met down there, and I rather accidentially crashed into them. They were like nervous fluttering spinsters, not really knowing how to gather the fleeting parts of their skirts. Years can be scared too, I found. They don’t like to be confronted directly, rashly. They like to keep a little distance, being talked to gently, not harshly. Years, it seems, fear us more than we fear them. Which is quite understandable, given how fragile they are, shapes of air and memories, to break apart when intruded too directly. Get rid of therapy, then, folks. You are killing them. They need a more polite, a more gentle approach. heard a year sing? This endless joy, floating over this sea of sadness and silence? One of the major errors in my life has been to misunderstand the goals and dynamics of the idealism I’ve felt about who I was meant to be or to become. For years, on this delicate level of conscience and premonition, I’ve felt that who I was meant to be, this somewhat heroic self from the future, was like a guiding spirit, answering me in my daily conundrums, as banister and principle. Accordingly, I felt weak and inferior to the ideal self that was hovering over me. I never matched up to this spirit that was whispering to me. Which, of course, was its duty, in those times. To realize, or materialize, a higher goal, ambition, duty, is, for one, to stay true to the guardian who keeps you waiting at the doorstep, hindering you to pass until the moment, when the time is right, he slips aside, effortless for him and for you to pass. But on a different account, it is to become this guarding spirit itself, and you won’t become it as long as you stay in veneration and awe of this ideal. The different approach, or rather: the next necessary step, then, is to yield to your weakness and inferiority you only perceive because you sense and listen to this higher guardian. You do this by accepting your weakness, your inferiority. You embrace the awfulness you learnt to detest (even: disdain) from the beginning. That is: In gradually internalizing that which you despise most in you, your angel sinks down into you, and yields the doorstep for you to pass through. The fear of becoming a bad person can be both, an admonition from above, and a recognition what to become in order for the above to become below. In both ways, this is not about the shadow and the nonsense of incorporating it. You don’t incorporate the shadow — that is the cleansing fiction of psychotherapy. This is not about self-administered redemption, this hubris of the undercover ego. This is about moral and conscience. Or rather: the spirit-sides of them. We learn to die by learning to have our ambitions die, our hopes, our ego, our soul, then the world, then all. We die into living by giving birth to death. To become a bad person is a fear that cannot understand its goal. You don’t become a bad person by yielding to become a bad person, as your fear keeps telling your still fighting ego. Becoming a bad person is to embrace the biggest fear you have about yourself, not about your abyssess but about what you’re capable of, this Dr. Mengele inside you who would love to torture and would love to kill. To let go of the ideal about yourself, or rather: to let go of the trust that there is a better version of you guiding you from afar like your star, this embrace of the unfathomness is what makes you more and more the ideal person down here. There are many ways to die, and to live by gradually yielding to death, defeat after defeat, only becomes this destructive agony when we insist on keeping the ideal apart from us, as guiding principle, over and above ourselves. The angel we never touched, because we needed it afar. But by yielding to what we’re ashamed of and what we fear to become, we turn out not to become what we feared. Yielding to what we feared, allowing us to feel and see us in the light of what we thought we could never and should never be, is the step to become capable of acting according to the angel we sensed. What once was a measure to judge ourselves becomes a talent upon which to sense and to act in this world. You may also have a look into my «Being a Bugger» (2013), «Strip-Mining the Heart» (2014) and «Love – Or The Other?» (2015) which approach the topic from other angles. As the approaching war becomes more obvious to more and more people , we should stop lamenting about the «unthinkable» (which, ironically, is always a «do-able»), and start asking concrete questions of how the war will start. A full-fledged thermonuclear war is not likely (although errors and mistake may occur, and the Russia-Nato-conflict in Euope may turn into a full-fledged conventional confrontation). What is likely, though, is a preemptive nuclear attack to effect a large scale EMP («electro-magnetic pulse») in the upper atmosphere, to fry all electronics, grids, computer chips, software of an adversary. As neither Russia, nor China, the U.S. or North Korea possess a defense shield against incoming ICBMs, it suffices to detonate one (!) nuclear warhead in 20 kilometres height to cover a circular area of about 5,200 kilometres in diameter. In Europe, this would roughly be the distance between the Ural-mountains in Russia in the east and Gibraltar (between Spain and Marocco) in the west, with an explosion in 20 kilometres height above Frankfurt (Germany) or Warsaw (Poland). Right now the U.S. does not have a reliable missile defense system against such ICBMs. Given North Korea’s economy, it makes no sense for her to develop a huge arsenal for a conventional thermonuclear war. But it suffices to place just one nuclear warhead in 20 km height above the U.S. (east or west) for a decisive EMP. In fact, wageing an EMP-attack right now would be a reasonable endeavour for North Korea, as a reliable U.S. defense system will be in place only in a couple of years. The results of an EMP would be, on the one hand, the breakdown of infrastructure, the grid, the facilities, the banking system, the internet. You are free to imagine a two day, three day scenario of urban riots when water, banking, shopping, traffic, etc. are no longer available. But the more pressing problem is the consequence of an EMP on the nuclear power plants in the U.S. True, its approx. 100 nuclear power plants are mainly placed in the east of the U.S. , with only a few on the west coast. But given an EMP, inspite of emergency power supply by diesel generators, cooling will be a huge problem (esp. when the outtake streches over a longer period of time). Core meltdown (like in Fukushima) is likely to occur. (Imagine just two, three or even more Fukushimas at the same time. How do you think emergency response forces will deal with such a multilayered crisis?) The meltdown of the cores of nuclear power plants poses the biggest threat to environment, people, infrastructure after and due to an EMP-attack. Given the ease with which huge damage to the infrastructure can be achieved with pretty little means, a military EMP-attack seems the most likely course in a military confrontation — not just between North Korea and the U.S., but, by parity of reasoning, between other players in other theatres as well. As more small nations acquire the means for such attacks, the likelihood of such an attack increases. Assuming that there will be no major conventional armed struggle between Russia and Nato on the one hand and the U.S. and China on the other, the conflict between the U.S. and North Korea, with North Korea attempting to launch an ICBM for an EMP-attack on the U.S. or the U.S. preemptively attacking suspected North Korean launching sites, is the most likely scenario. How China then will respond remains difficult to assess. ∧ Harry Leslie Smith, «In 1939, I didn’t hear war coming. Now its thundering approach can’t be ignored», The Guardian, Monday 14, August 2017, 13.00 BST; and my «Weather Fronts», Dec 30, 2016. 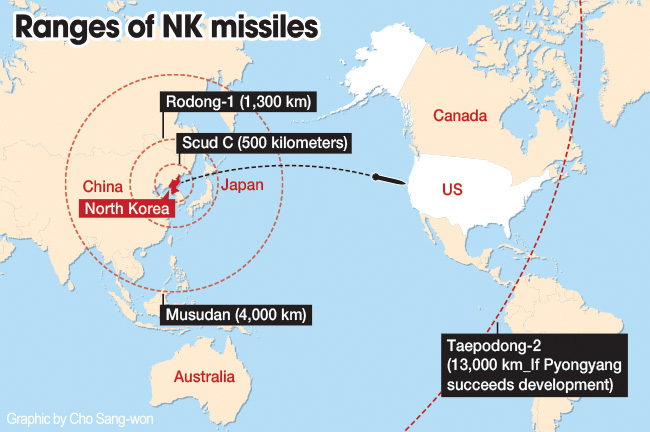 ∧ Michael Arthur, «Taepodong-2», Missile Defense Advocacy Alliance, n.d.
 ∧ Yi Whan-woo, «NK rocket test is to hit any city in US mainland», The Korea Times, February 3, 2016. ∧ Map of US Nuclear Plants, Nuclear Energy Institute, 2017. Since the web became ubiquitous in the early 2000s, the centre of our focus and attention shifted to the screen. Although, that is not entirely true. Television had been ubiquitous too, and the hours the average adult spends watching TV may have only slightly decreased over the years whilst the use of web-capable machines increased. People may have switched the underlying machine, but the habit of being glued to a screen has remained pretty much constant since, I guess, the early 1970s. People do different things at the screen. Formerly called programmers, software developers sit in front of them typing codeline after codeline. Authors and writers have long abandoned the typewriter and use the computer as text processing machine. People may watch less cable TV but instead simply switched the provider to watch the movies online. Streaming services became the norm while cinemas and movie theatres keep closing shop. Music, once purchased via vinyl, then CD, now stream as well; purchases became micro by the advent of online single song purchases. For many years activism for social change, environmental preservation, working rights, political resistance used different venues. Now much of it occurs via the screen as well. Social media and formerly relevant publishing tools like blogs made audience-building and pressure coordination a more screen-oriented, detached activitiy. Protests still happen in the streets and the courts, communities still spring up at parks and in neighbourhood quarters, but the coordination, the organization, the talk, the chatter now happen via the screen-machine. With handhelds and web-capable telecommunication machines, the screen, not the specific underlying hardware, became the most important aspect of today’s instant access. Access and screen, be it touch, press, or click, merged into one, the underlying machine rather a question of convenience and consumer preference than of task- and end-oriented hardware choice. Today, the most important device that connects people with the web is the screen. It may, in some future, be replaced, e.g., by a brain-transplant, but right now the screen is what makes people act and react. We don’t even need to point to the ubiquitous stare of people at their handheld devices, be it smartphones, tablets, or e-readers. What we do have is the omnipresent connection of the human eye, the human mind, and the screen a few centimetres away from it. One change since the early 1970 is the replacement of the traditional cathode ray display by the liquid crystal display, which made the individuation of screen-machines possible. The devices became portable. But what did not change since the dawn (and spread) of televison is that when looking onto the screen, we look into a source that directly emits light. Before screens became ubiquitous, the way we looked at the world, at movie screens, at newspapers, magazines, books, was looking onto surfacees that reflected light stemming from another light source. That is, we used to look into the world by relying on indirect lighting. The (rather) rare exceptions when we would look into direct lighting were the lights of the streets, the cities, the work places and of nightlife. Apart from that, the sun would be the main direct source of light emission. Into which we would rarely stare. I don’t know how things changed evolutionarily, or if they changed at all, when we began to substitute confronting ourselves with indirect lighting by confronting ourselves with direct lighting. Perhaps the stare into the direct light source does indeed put us more into a dream-like state, circumventing rational and verbal thinking, directly entering our subconsciousness. Or perhaps the stare into the direct light source fuses a dream state with verbal and rational elements. But being glued to the screen makes us look away from a world of indirect lighting. Instead we are locked to a source of direct lighting, in which things don’t stay fixed and calm, but rush to change and replace one another. So what might be said, on this broad, over-generalized level, is that for most people the web and the machines to access it are little more than interactive television. It’s television in which we participate on a myriad of levels and aspects. But it still is a shiny screen. And we keep being glued to it. Attention is linked to appreciation and that to commitment, even love. We not only care for what we love, we also love what we care of and care about, as Shery Turkle once wisely observed. That is: Whatever we invest our attention and appreciation in, we sooner or later begin to love, that is, to be concerned about. That doesn’t mean that we learnt to love our gadgets and the screens that go with them – although that, in a sense, isn’t false either – but that we learnt to love what we interact with, or create, or belong to. People started using the computer as a «tool» to solve problems, getting tasks done, and ended up devising more and more tasks the solution of which then demanded even more time to spend with the computer – or more precisely: with the screen. This is not to say that we are facing a worldwide pandemic of addiction to screen-mediated flicker – although one could argue for that as well – but that we came to convince ourselves that the amount of attention we can spend a day is somehow best spent with a screen. But if you look into one direction, you look away from another. Watching the screen means looking away from what happens aside of or outside the screen. Which we then try to accomodate by looking at those things via the medium of the screen. But when things become relevant insofar as we can watch (or rather: catch) them on a screen, by looking into a lightsource directly emitting light, they no longer stay relevant in the world of indirect lighting, of bodies and concrete. That is: The screen turns the things of the world into information and images. They thus become checkers or tokens – which can be a good thing – in danger of their own meaning getting lost – which mostly is a bad thing: when we stop listening to what the things want to tell us, we begin substituting their voices with ours. A few years back the term «Anthropocene» made its entry in the boundless talks and thoughts attached to screens. And recently, people started to say that we now indeed have entered the geo-historical era of the «Anthropocene», in the sense that there are no further corners of the world untouched and unchanged by human intervention, meaning that everything we now can discover and experience already has a man-made touch or is of man-made nature. Wilderness, not in the Romanticists’ sense but in the sense of «untouched by man» has become a lost «category». All we can encounter in this world, on this planet, is already a mirror of who is encountering it. There is a sadness, even desperation, that comes with the loss of wilderness and the ubiquity of human intervention, the loss of something that is part of the world but still not made by humans. The staleness of a world in which everything we find is from man-made industriousness discourages us from caring for exactly this world. A purely man-made world, it seems, is ex hypothesi a world not worth saving. When everything is just what a ridiculous plan has devised and incompetently brought about, then all we find out there is a shadow image of ourselves, and even a lesser one. Then why keep looking into that mirror, when all it shows is the Gollum, not the Elf? What I’m trying to make plausible is that the talk of the «Anthropocene» has a very important inherent flaw. It sees the world as remaining solely of man-made and man-influenced items. That, what is not man, the wilderness, is no longer part of what once has been called a world (in a slightly different sense). A world that encompasses man-made and man-independent things (or «aspects») is different from a world that solely encompasses or consists of things made or touched or influenced by man. The former leaves the hope that things may still change unexpectedly, into a direction we couldn’t have fathomed or dreamt about in advance. It makes the world a place to discover, to play with, to marvel about but also to fear. The other world, the one containing solely the things (purportedly) being made, touched or influenced by man, is the stale world of multi-storey car parks, skyscrapers, and theme parks. The world of everlasting amusement, challenges, research, work, sustainable design options, self-realization, etc. It is also, like in Antiquity, an encapsulated world, beyond which nothing exists but chaos. The need to live in a world not made by ourselves seems deeply ingrained in our psychê. The wilderness «out there» seems to be needed as a handrail for walking through the wilderness «here inside». Lose the former and what happens to the latter? It seems, just seems, to vanish as well, leaving stale rational constraints and obligations as the parameters of reality. But that might not be the case. Perhaps the «wilderness inside» just re-appears outside, inside, throughout, as disfunctionality of societies, of economic systems of quantitative exchanges, of paranoia, despair. The wild, that is, will not disappear, it will just return in a different guise, as «problems» that entice us to «solve» them by rational means and technical expertise. And thus make them worse. So what the talk of the «Anthropocene» gets right is that there is the conceptual option of a world containing solely man-inspired items, with all the staleness that goes with it. But it goes wrong in two other ways. The one is to think that wilderness simply disappears. It in fact re-appears as disfunctionality. But to think disfunctionality is tantamount to practical design problems asking for a solution will not only not solve or enhance anything, it will reinforce the urge to further purge the world from wilderness all together. But even more important is the second way this talk goes wrong. It forgets that the «Anthropocene» is not something we discovered «out there», in some world of mud and stone, but in the intermediate realm of the screen, of us glued to the screen. In which things already appear not as themselves but as hearsays, as information, as checkers and tokens, which we inflate and shrink at whim, according to and depending on the attention we pay them. And which haunt us inasmuch as we care for them. In order to keep the right balance in a world made of screen, we try to resort to the science that already proved so successful in establishing the laws of a world that wasn’t us: mathematics. And so we keep using statistics, polls, measurements, extrapolations, bell-cuves, algorithms, data structures, topologies, in order to re-visualize the world we once knew to be not of our making. And we keep pushing the Myth of «algorithm neutrality», thereby falling below even the crudest form of 19th century Empiricism that, in itself, had always been a strangely concocted theory about the world and our making sense of it. In doing so, mathematics and its related structural sciences merely enhance the fanciful character of what we take to be items outside the screen. In a sense, this can be seen as a variant of Donald Davidsons «Third Dogma of Empiricism», this time the Myth of a distinction between a pure topic «out there», and a medium of «access» (i.e., representation) – screen, pure eyes, experiment – somehow «right here». In this Myth, the means of our visualization are independent and don’t constitute or impact the nature of the things we’re talking, marvel or worry about. But mathematics and her related structural sciences will not tell us what formulas to apply and what theorems to prove. That is, following the argument (or rather: following the deduction) is only as good as the premisses and axioms we still are required to choose. In particular in the sphere of the screen, where things reappear as data, topologies, structures, or images and films and movies and texts, what comes about is almost entiriely determinded by the choices we have made in the beginning. What to put onto the screen, in which way, in which mode of representation. Mathematics and her siblings thus become subsequent justifications of choices already made without them. We may still «follow the argument» in the hope of a reductio ad absurdum to occur, but that by no means is guaranteed to be an endeavour to be reached effectively and in finite steps. Not really a way to ascertain the «reality» of the things we began with. Of course, the talk of the «Anthropocene» was only meant to serve as an example. This is not about the «Anthropocene» but about the impact of being in a world that more or less happens via the perception through screens. It makes things appear of being of our own making. In thus appearing as of our own making, the things, the world, tend to become stale, hopeless, as all we find is the stuff we have already put inside them, not what they might tell us of their own. In that, we give up hope of a world not, or not entirely, of our own making but still relevant to us and to our fellow beings. When things become all equal, what matters is not what they tell us but what we find important. That is not dangerous or limiting in itself, rather a call to our conscience and awareness. But right now, via the screens and the modes of our perceiving them, things turn out to tell us what we already know. They cannot tell us of their own. In that, the world becomes a boring place, a desperate place, a place without a livable and worthy future. We give up. Even, or perhaps: especially, as the problems magnify and the dangers grow. The screen becomes the machine of our surrender, surrender not to something higher than ourselves but to the fatigue that permeates all that we know. For more than 50 years now we have lived with the screen. It became ubiquitous in the way we understand what world is. That all the liberating fantasies of this technology (be it, first with television, then the computer, then the web) turned out false is one aspect; that it enforced our hopelessness and despair quite another. That we still turn to the screen for solace and encouragement, is the third and perhaps most vicious aspect of it. As we love what we care for, we keep being glued to the screen, even and specifically because of our best intentions. And this is the most terrifying feature of the screen: Not only does it need our attention and care, not only does it induces in us love and admiration, in keeping us hooked to something with which we cannot act nor understand nor go away, it became the most intrusive surrender machine of the last 550 years. The screen will not go away. We will not switch it off. We will never know how the world is outside the screen – to the detriment of us and the fellow beings that experience our screen-mediated activities. Wilderness has been reduced to malfunction, and in this lies the most terrifying aspect of our surrender. It’ll make us unable to face the wilderness that is about to come. ∧ Cf. Jacqueline Howard, «Americans devote more than 10 hours a day to screen time, and growing», CNN Health, July 29,2016, 20:22 GMT. ∧ Akiko Busch, «Q+A: Sherry Turkle (February 2008)», I.D. The International Design Magazine, Vol. 55, No. 2, March / April 2008. ∧ Cf. my «Weather Fronts» (2016) on its inherent violent character. ∧ … and the predominance of «practical constraints» and «matters of facts», which pose their own problems, cf. my «The Fetishization of Practical Constraints» (2016). ∧ To be more precise: The ancient Greek word «oikos» that was tanatamount to «world» is usually translated as household. It is the proximity that is familiar. Accordingly, what lies beyond it is the un-familiar, which in ancient Greece took the form of the chaos, the disorder, the void. This distinction changed in the Roman-Christian-West in which the world (lat. «mundus») is what is part of the divine salvation whereas that outside it, the «un-familiar», is the sphere of what is not part of the divine salvation, thus is the «sphere» of the un-redeemed. It’s worth highlighting that these old conceptions are still (or again) underlying the current usage of terms like «Anthropocene». It thus shows a relapse into terminologies and practices that are quite inconsistent with a purported modern, secular use. ∧ I first became acquainted with the term «algorithm neutrality» and its associated problems through Evgeny Morozov’s article «Don’t Be Evil» (The New Republic, July 13, 2011, 9:30 PM). Another link to it is here. ∧ Cf. the discussion of the Three Dogmas of Empiricism by Willard Van Orman Quine and Donald Davidson. ∧ See note 7 above and his seminal article: Donald Davidson, «On the Very Idea of a Conceptual Scheme», Proceedings and Addresses of the American Philosophical Association, Vol. 47, (1973 – 1974), pp. 5-20. 1. Trumpism is a rare blend of fascism and incompetence. 2. The «alternative facts» of Kellyanne Conway and Sean Spicer, the executive orders of Stephen Bannon and Stephen Miller? They are not so much malice but the embarrassing display of brazenness and incompetence. 3. The Trump team yearns for nothing more than respect and deference. They want to be taken seriously. Problem is: they are amateurs. 4. They confound the public with one idiocy after another. But that is just the amateur’s way of trying to stay atop. 5. If you panic, they feel like being in charge, ahead of you. Don’t allow them this advantage. Trumpism is a dangerous ideology and a dangerous program. It will undoubtedly harm a lot of people. But resistance can only become successful if and when we break the spell of their brazenness, that is, if and when we stop respecting them by offering them our fear. Look through it. They are amateurs, they are insecure and yearn for our respect while at the same time they try to push through a major program. Break the spell. Laugh about it. Laugh about them. Then fight them in the courts. Somehow all the books came too late. The ability to read that I had lost for I don’t know how long finally returned and I started to read books again. Not many, often interrupted by days, sometimes weeks, but steadily, and I could turn the pages, soak in stories that told the stories of old weather fronts in the skies of men. Weather fronts in the skies. Which I had followed, at least the more recent ones, reading news articles on the web. So I was acquainted with the winds, or rather, the heavenly currents that underlie this meandering that clouds are often only the visible foam of. The currents were visible, if only by watching the weather fronts, those dark greyish blue heavy agglomerations that filled the skies beyond the eyes’ capacities to grasp. It was all there. We all could see. Still, most drew the wrong conclusions. When times come to an end, when epochs close, turmoil and conflicts arise. That’s how most people see it. But it is different. When things tend to become clear-cut, conclusive, one-dimensional, that’s when conflicts, turmoil, even violence arise. Conflicts, turmoil, violence don’t bring about the end of a time but are the result of a time that is becoming a certain way. And it is this way, not the time that births them. In that sense, most dystopian science fiction gets things wrong. They not so much exhibit some form of end times, although they may convey the character and the flair of a dystopian a-temporality. They rather describe processes of dwindling options, receding alternatives, vanishing perspectives, and with that: the loss of hope that things could be different. Only after things seem settled, realities fixed, the shape of the long everlasting Now decided, is it that the cataclysms occur. As long as there are still factions or factors competing, the catastrophes are still in the offing. So when I finally recovered and became able to read again, the books already came too late. The loss of alternatives and political options had already hardened into a brutish insistence on practical constraints. Things needed to be thus-and-so, and it was pretty irrelevant if that meant the political, the economic, or the personal sphere. It was the time when it became clear that the war was only months away. Things had dwindled in their manifoldness, facts had become single-minded ways that shunned rivals. The lust and the need for power recommended itself not as politicians’ whim, but as a practical constraint for survival in times that appeared to have miraculously turned harder and harder. The war that was about to come was not to begin because other means of engagement had been exhausted; it was to come because those means of engagement had been so efficient and successful, had been applied by everybody, had first created the same flair, then contributed to the same reality of uniformity. The end of history, like some had called a somewhat related phenomenon of years earlier, had been declared short-sightedly and wrongly, not because it took the a-temporal long Now of missing options and alternatives at face value, as a sign for an everlasting epoch of political and economic «being thusly». What the talk of the end of history had missed was that by becoming uniform, «thusly», things themselves turned into the source of violent upheaval. The end was not a «thus» but a beginning, the beginning of a new war that was meant to tear apart the one-sidedness of the long Now, to return the world to a state of renewed options, perspectives, even paths. The weather fronts that could be seen in the skies were the signs not of a history past but of things to change. As simple foam they were the faces of people; as the current’s foam they were the tide just before breaking to the trough. When I sat there at the close of the year 2016, I was awaiting the war to start some time in the year 2017. And at some point it didn’t even seem to matter whether I could detect the signs via the books I was again able to read, or whether I could corroborate my feelings with words of those telling from other weather fronts of former times. It made no real difference anymore, now, at last, in the short moment of a deep sad breath, as the first drops began dripping from the skies, then turned into the heavy rain that was meant to last for a long time. Like most, I had missed the opportunity to build an ark for the things to survive into the new times.